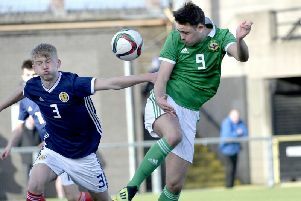 County Londonderry starlet Lee Harkin lit up the Coleraine Showgrounds with a stunning performance that saw him register two goals against Manchester United, as the local side recorded a famous 2-1 win. As manager Martin Smith was at pains to point out, it was a team performance but Harkin’s impact was hard to ignore. The 15-year-old may he get a dream move to Old Trafford, with United’s scouts already aware of the Derry City starlet’s huge potential. Smith said, “Lee is a top player. To have that much talent in the locker at 15 is something else. If he keeps his head and keeps progressing, he will do really well for himself. Manchester United know all about him. He was there on trial a month ago. He was very unlucky not to get his hat-trick. But the boys were superb from 1 to 11, plus all the subs. I can’t fault any of them. It was a team effort and I’m absolutely delighted. Harkin opened the scoring after 25 seconds. The boys from Derry attacked the Red Devils straight from kick-off, setting Harkin free on the right-flank. The highly-rated youngster produced an audacious lob, that United goalkeeper Daniel Polakowski could only help into the net. Derry’s lead didn’t last for long. The County side conceded in the ninth minute when United’s Nigerian striker Jovani Molenge followed home a rebound to equalise. At the start of the second half, Charlie Savage, son of pundit and former Milk Cup winner Robbie, almost gave United the lead with a beautiful free-kick that cannoned off the crossbar. Harkin thought he had scored again for Londonderry when he cut in from the flank and drilled in from the angle, only for the goal to be ruled out as the referee’s assistant believed the ball had gone behind for a goal-kick. Harkin scored another stunning goal, 14 minutes into the second half. He shimmied in from the flank before smashing the ball into the roof of the net from just inside the area. That strike proved to be the winner. In the same group, Club NI drew 1-1 with Rangers at Scroggy Road while County Armagh also claimed a scalp. They beat Leeds United 2-0 at Seahaven in Portstewart. Southampton confirmed their credentials as title contenders with an impressive 4-0 win at Anderson Park in Coleraine. While it was tough afternoon for Tyrone against English opposition, Gary McAlister’s County Down celebrated a 3-1 win over Charlton Athletic. Ards player Jonah Heron opened the scoring in 55 seconds with Lewis Davidson and Jamie McDarby adding goals in the second half. County Antrim claimed a point, drawing 1-1 with Mexcian side Chivas at Anderson Park, while fellow county side Fermanagh drew 1-1 with Plymouth Argyle at Clough, with Jamal Tavares on target.